At Jauhal Dental a major complaint from our patients is aching jaws and headaches. The answer is a night guard. The most common cause for these complaints is a condition called Bruxism which is the grinding of the teeth.The reality is that we all grind our teeth on occasion, when we are angry or anxious or when our sleep is disturbed, but if we are grinding our teeth on a regular basis that is called Bruxism. Bruxing can have a negative effect on tooth enamel, bone, gums and jaws. Continual grinding or clenching can cause wearing and cracking of the teeth and problems with the jaw. The sideways movements of the jaw, with the teeth just touching. This is more common during sleep and is in response to sleep disturbances which causes brain stimulation. It may also be the result of the side effects caused by certain medications being taken for treating depression, developmental disorders and schizophrenia. Clamping the upper and lower teeth together and is more likely to happen during the daytime. This leads us back to why your dentist recommends a night guard. This is bite plate that has been custom fitted by your dentist and is made of hard acrylic which is custom fabricated by laboratory technicians and can be worn night or day. 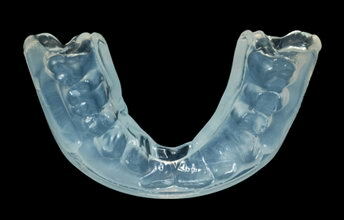 It acts as a bumper absorbing the force of the clenching or grinding and can help avoid the problems. At Jauhal Dental each patient undergoes a bruxism evaluation to determine the extent of wear and tear on your teeth, gums and jaw and provide a practical remedy to offset further damage. If you suspect you are clenching or grinding your teeth please consult your dentist to undergo a Bruxism evaluation.